As a long-time fan of Australian interiors magazine Inside Out and with a huge interest in sustainable architecture, design and furniture, I couldn’t resist purchasing a ticket to the publication’s first ‘Open for Inspection’ event, which was held on Tuesday 26th August. What a fabulous way to spend a weekday morning! The events are designed to be a chance for the general public to embark on a guided tour (and I don’t mean just any guided tour either – we were chaperoned by Inside Out’s Editor Claire Bradley and Sydney-based stylist Lisa Koehler (@lisakoehlerstylist)) of one of a selection of design-savvy homes in urban/suburban Australia. 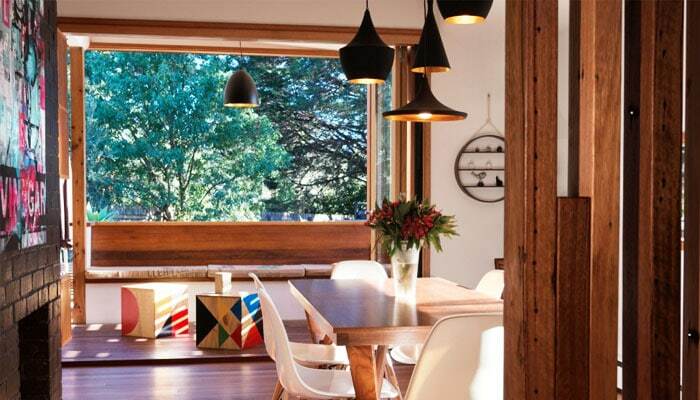 In this case, the home in question, located in Melbourne’s Nunawading, belongs to Sven and Dawn Maxa, owners of energy efficient and environmentally sustainable building design and construction company Maxa Design. Completely corny and cliched I know, but this home, in my opinion, is close to perfect. And I don’t just mean aesthetically beautiful and an absolute pleasure to be in, but functional, efficient and practical. It was wonderful to be in a space that was warm, inviting and inspiring but also felt lived in and enjoyed – like it wouldn’t mean re-constructing the living room if a glass of red wine was spilled! Despite the contemporary overhaul completed by Dawn and Sven a few years ago, the house’s original modernist bones and heritage were evident, providing a very comforting, characterful touch. Along with the subtly painted ceiling beams and what appeared to be an original set of large rectangular windows framing one of the many backyard vistas, the timber floorboards throughout the home were in amazing condition and only beautified by the Maxa’s devotion to maintaining them with a strict warm-water-only cleaning regime. Furniture, artwork and homewares have been chosen considerately and with an emphasis on vintage-inspired timber and plywood pieces with earthy, muted tones, screenprinted fabrics and geometric, industrial graphics. The bold coloured plywood boxes in the back deck area were a particular highlight for me. Upon further enquiry I was informed that Dawn made these herself whilst heavily pregnant with her son a few years back. A creative distraction with amazing results! I noticed pieces sourced from local suppliers and artisans including Spacecraft, Treehorn Design, Pop & Scott, Bonnie & Neil, and Pop Plant, amongst many others, and also design classics including Orla Kiely bathroom towels, Jorge Ferrari Hardoy’s Butterfly Chairs (available locally through Angelucci 20th Century), Eames Moulded Plastic Side Chairs (available through Australian Herman Miller reseller Living Edge) and Tom Dixon’s Beat Light Pendant Series (available through GoLights). Morning tea at the event was lovingly supplied by catering company Pot and Pan (the wait staff were not only extremely friendly but the food and beverages were delicious and works of art in themselves!) and we all left the session with a very generous goodie bag including a copy of the latest issue of Inside Out and a deluxe, fragranced Circa Home candle. I cannot wait for the next event and wanted to share with you the Top 5 Tips I took away from the morning, which I hope you’ll find useful! 1. Don’t be afraid to be brave in colour choices for walls and decor. The black colour of the brick divider/fireplace between the living and dining space was bold but brings so much life to the house and helps to further define separate areas and highlight furniture and artworks. 2. Be true to your own aesthetic sensibilities. Don’t buy pieces that are on trend, but rather choose pieces that reflect who you are and what you like. The Maxa’s apparently copped criticism on social media for their use of a recycled particle board bed head (for what reason, who knows!) but it looks absolutely brilliant and reflects their passion for sustainable materials. 3. Be inventive. If there is a piece of furniture in your head that you cannot source, perhaps set it as a creative project for yourself to make (time and cost permitting obviously!). Dawn’s geometric coloured outdoor cubes are a case in point. There is also the added benefit that no-one else will have them! 4. Greenery ALWAYS livens up a space. There is nothing like a few plants, fresh flowers etc to make a house feel like a home. 5. Keep things simple and practical. Over-cluttering spaces with objects never works and you want to be able to live in a space, not just look at it! More info about forthcoming Open For Inspection events can be found on the Inside Out Blog and a series of images from the morning is below. The back decking area, complete with plywood geometric cubes handmade by Dawn!